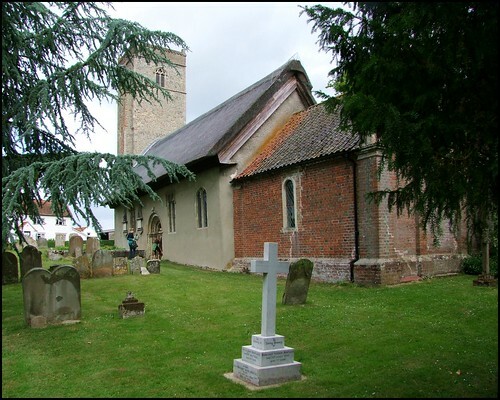 This is a pretty little church in the pleasant rolling landscape on the north side of the Waveney Valley. This area is so far from either Norwich or Ipswich that it has a self-sufficient air, as if people might really live and work here rather than just commute somewhere else. Opposite the church, a long bank of bright red nasturtiums made a lovely counterpoint to the green of the churchyard. Like many churches around here, this is a simple Norman nave huddling under thatch, and not much altered over the centuries since. The 14th Century square tower probably replaced a round one, and there is a grand Norman doorway set halfway along the south wall of the nave. Curiously, the north side of the church has not a single window. The brick porch was added in the 18th Century. The church you step into is entirely rustic in character. The only medieval survival is the 15th century font, which is completely plain. However, the stem is similar to that of those in several other churches round about - was it unfinished, or did the bowl come from elsewhere? The chancel is simple and elegant; the screen is a nice simple Georgian piece which must be contemporary with the rebuilding. The glass in the east window was restored after being blown out by a stray bomb during the Second World War. While I was exploring the church, a woman and her daughter came in to clean. They were locals, but they told me that they did not attend the services here. Over my years of visiting East Anglia's rural churches, I have often found local people cleaning, cutting the grass or doing repairs and the like, who tell me this. In a way, it is reassuring to think that such people feel a sense of ownership of their parish church, even when they are not members of the congregation. Incidentally, the lady also told me that she attends the Catholic church in Bungay, even though she is not a Catholic. I have heard this several times from people I speak to in this part of the world. Bungay Catholic church must feel like a welcoming place. The lady told me that plans were in hand to clear the nave at Thwaite St Mary, so that it could more easily be used for secular events: concerts, exhibitions and so on. The chancel would remain in use for services for the small congregation. It would be nice to think that this church could be an increasingly useful asset to the people of its parish.